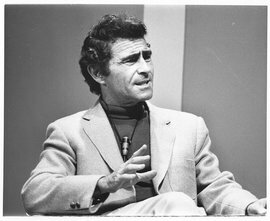 Anne Serling told an LA Times interviewer one reason her father became a writer. Not only did your father have physical issues because of the wounds he suffered in World War II, he also had nightmares of his experience in combat. He absolutely did. I vividly remember him having nightmares and when I would ask him what happened he said, “I dreamed the Japanese were coming at me.” Back then post-traumatic stress disorder wasn’t even a term. He always planned to go into teaching kids physical education, but because he had been so traumatized by the war, he switched to language and literature. He was quoted saying he needed to get it off of his gut and out of his system. Serling had not given up writing about the world’s crises. He would script what is generally regarded as the bleakest Christmas movie ever made, an adaptation of Dickens’ “A Christmas Carol” about the horrors of nuclear war. Aired in 1964, “A Carol for Another Christmas” includes a visit to Hiroshima. The leads were played by Sterling Hayden, Peter Sellers, and Britt Ekland. This entry was posted in Poor Trufan's Almanack by Mike Glyer. Bookmark the permalink. Certainly a very weird Christmas movie! Only Rod Serling could write like that and get away with it … some of the time. Was that actually released in theaters? It looks so much like television production, somehow, rather than for the big screen. It would be amusing to confront these three “ghosts” and inform them that the UN was a success, we are much better at talking than we were before, and that there are united, coordinated efforts toward alleviating poverty, ignorance and disease … but now we’re being overwhelmed to automobile exhausts and religious zealotry… any suggestions, guys? It was a made-for-TV movie, broadcast once in 1964 and mothballed for almost fifty years.